There was the customary talk about the shadows of the years and the ravages of the law of averages when Sal Maglie went out to meet the Yankees yesterday afternoon. It was the first time, after all the years, that he had ever pitched in Yankee Stadium, the home of champions. He threw that humpbacked setup pitch that is last in the warm up, and then for the first time looked at Hank Bauer. He threw the curve in; Hank Bauer made a gesture at hunting; and the strike was called. The hitter leaned over a little; the pitch was high; Hank Bauer skittered back in haste and the ball went by the catcher’s mitt and back to the wall. “The call was for an inside pitch,” said Sal Maglie later. “I threw it too high and it got away.” He is a gracious man who takes no pride in the legend of professional venom. He worked his arm a little and blew on his hands as though he came from a world no sun could warm. And then Bauer plunked it up to Reese; Maglie looked once at the ball and then at the fielder, and, without needing to see the catch, bent over and worked his long, brown, dealer’s hands into the resin bag. He got Joe Collins to hit on the ground to the wrong field; Mickey Mantle went all the way around; Sal Maglie heard the sound and judged it. The left fielder was still circling under it when Sal Maglie crossed the foul line on his way to the dugout. He gives very little and can afford to to spend less. Sal Maglie ended the third for the Dodgers, walking out slowly carrying one bat, digging his spikes In as though anything ls possible in this game, driving the first pitch straight to Mickey Mantle and walking over towards third base to change his cap and get his glove. He threw the warm-up pitches; Roy Campanella was standing up and almost dancing at the plate. Maglle got the two quick strikes on Bauer who hit to Jackie Robinson; Maglle did not look at the play; he was busy with the resin. He pushed the curve by Joe Collins; it was the third strike. Mantle was back. The first strike was a curve and called. There were no times intrudlng upon the memory when he had seemed more sharp. He threw the next pitch outside, and then hit the corner again. He waited awhlle, rubbing his fingers on his shirt, wiping the afternoon’s first sweat of his forehead. He threw a pitch on the corner that was low by the distance of a bead or sweat from the skin; it was that close and was called a ball. Mantle hit a foul. Sal Maglie knew it was out of play; the left fielder was still running and he was working on a new ball. The next pitch he threw Mantle was down the middle a little inside. Roy Campanella said later that he hit on his fists. Sal Maglie watched it almost curve and then stay fair in the stands; with the unseeing roar all around him. he walked back to the rubber and kicked it once. “He’d been fouling off the outside pitches,” he said later. “I thought I’d try him Inside once.” He stopped for a minute, naked and dry beside his locker, the skin showing through the thin hair above his forehead. “That shows what can happen when you’re thinking out there and the other guy isn’t.” That was as close as he came to suggesting that God is too tolerant with the margin of error he assigns the very young. Then Yogi Berra hit one hard to the wrong field; Duke Snider ran the distance of years, and tumbled up with lt. Sal Maglie had no reason lo know it then, but that was the inning and the run. In the fifth Enos Slaughter was walked very fast. Billy Martin bunted. Sal Maglie came scuttling onto the grass and snatched the ball and turned around and fired it high and smoky to second just in time, a 40-year-old-man throwing out a 40-year-old-man and knowing he had to hurry. He was sweating hard by this time. Harold Reese went up half his height and knocked it into the air and recovered it for the double play. Sal Maglie was watching the way the ball went now; the sound was different; for the first time today he had to think of the fielders. 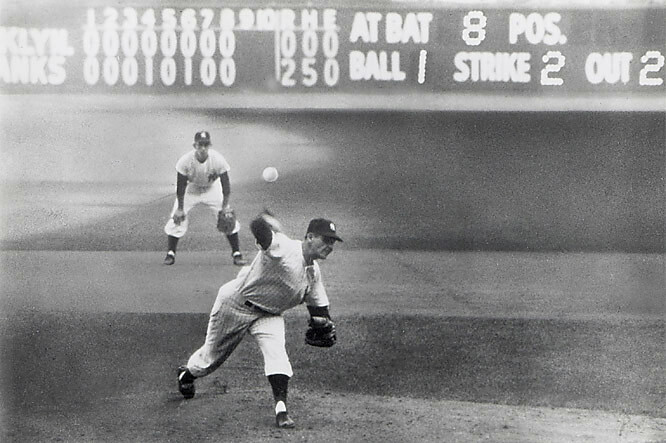 Don Larsen went on making the rest period painfully short. Sal Maglie took his warmups for the sixth; he was throwing the last one in hard now. Andy Carey hit one over his head into center and the old remembered tight rope walk had begun. Larsen bunted the third strike; Maglie and Campanella scrambled off too late to get the runner at second; they had made their mistake. Carey went far off second; Bauer slapped the ball to left. Sal Maglie drove himself over to back up third, but the run was in and safely in. Walter Alston came out; the conference went on around Maglie. A man in the stands said that if Labine was reasy, it was time to bring him in. “Take Sal out?” Campanella said later, “the way he was pitching?” Joe Collins hit a low, hard single; Maglie went over to cover third again and came back slamming the ball into his glove. Mantle was up. The first pitch was out of control; then he threw two strikes, one called, one swinging. Mantle hit the ball to the first baseman who threw to the catcher, who threw not well to the third baseman, who fell away and threw around Bauer to get him. After the game, Sal Maglie looked at Jackie Robinson sitting sombre across the dressing room: in a moment of surprise, Robinson’s hair was gray. “That was a throw,” he said. “Him falling away like that.” Maglie saw it and walked to the third base line and waited for the rundown so as not to interfere, like a waiter at his station, and then walked slowly back to the dugout. They asked him was he satisfied with the game he pitched. “How,” said Sal Maglie, “am I to be satisfied? But you got to adjust yourself.” To time and to ill chance, and the way they forget, you got to adjust yourself. Someone asked if you knew when you had a no hitter, and he said, of course you do. You remember who had hit, for one thing. “lf you ask me two years from now,” said Sal Maglie, “I’ll be able to tell you every pitch I threw this year.” He said it, in passing naked, his body white except for the red from countless massages on his right arm, tearing his lunch off a long Italian sausage. On the other side of the room, somebody asked Campanella if Maglie had made any mistakes out there. “Sal, make mistakes?” said Campanella. “The only mistake he made today was pitching.” He pulled on jacket and turned to what was last of the assemblage. Maglie was going now, as losers are required to go, to get his picture taken with Don Larsen in the Yankee dressing room.